"Oftentimes, we live in a processed world ' you know, people focus on the process and not results." 'George W. Bush, Washington, D.C., May 29, 2003. "The true strength of America happens when a neighbor loves a neighbor just like they'd like to be loved themselves." 'George W. Bush, Elizabeth, N.J., June 16, 2003. Speaking to a Missouri crowd about the effects of frivolous law suits, Bush recently said, 'Too many good docs are getting out of business. Too many OB-GYNs aren't able to practice their love with women all across the country.' He omitted the words 'of profession' between the words 'love' and 'with' in the sentence! "And, most importantly, Alma Powell, secretary of Colin Powell, is with us." 'George W. Bush, Washington, D.C., Jan. 30, 2003. 'You're free. And freedom is beautiful. And, you know, it'll take time to restore chaos and order ' order out of chaos. But we will." 'George W. Bush, Washington, D.C., April 13, 2003. "One year ago today, the time for excuse-making has come to an end." 'George W. Bush, Washington, D.C., Jan. 8, 2003. Bush also declared, "I'm the master of low expectations." (George W. Bush, aboard Air Force One, June 4, 2003). This inadvertent statement may also be fatidic. Bush has thrived on low expectations. It is a modern day political wonder how a man with such affinity towards syntax errors can become the president of the United States. In this day of television and Internet, one who puts on the best face or the most meaningful word, tends to win the hearts and minds of voters. Yet, the bumbling Texan - as Ralph Nader called him - managed to win the election from a far more eloquent Al Gore in 2000. 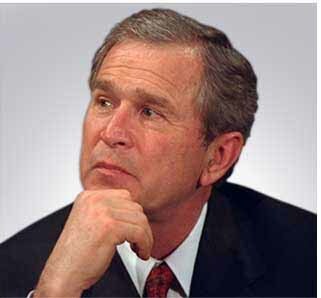 Some detractors of Bush have still not accepted him as president and accuse him of stealing the election. How can such a simple man win against an elitist lawyer? "In my judgment, when the United States says there will be serious consequences, and if there isn't serious consequences, it creates adverse consequences." 'George W. Bush, Meet the Press, Feb. 8, 2004. "I think war is a dangerous place." 'George W. Bush, Washington, D.C., May 7, 2003. "Security is the essential roadblock to achieving the road map to peace." 'George W. Bush, Washington, D.C., July 25, 2003. People were tired of Bill Clinton's hair-splitting verbiage with his definition of 'is'. When a man arrived on the scene, with whom most people identified, with difficulty in communicating, people saw an honest man and not a well oiled politician. George W. Bush looked human and won the hearts of many ordinary people. Al Gore's condescension, especially during the debates made matters worse. Even die hard Democrats thought that Bush did not have to endure the insufferable Gore! "I want to thank my friend, Senator Bill Frist, for joining us today. You're doing a heck of a job. You cut your teeth here, right? That's where you started practicing? That's good. He married a Texas girl, I want you to know. Karyn is with us. A West Texas girl, just like me." 'George W. Bush, Nashville, Tenn., May 27, 2004. "I'm honored to shake the hand of a brave Iraqi citizen who had his hand cut off by Saddam Hussein." 'George W. Bush, Washington, D.C., May 25, 2004. During his presidency George W. Bush has improved with his syntax and delivery. After the beginning of the war following the September 11 calamity, his moral strength has guided him. When he has time to prepare an important speech, he has not failed. He has delivered it with passion and substance. However, when called for extemporaneous comments, he still bumbles. "Like you, I have been disgraced about what I've seen on TV that took place in prison." 'George W. Bush, Parkersburg, West Virginia, May 13, 2004. 'Our enemies are innovative and resourceful and so are we. They never stop thinking about new ways to harm our country and our people, and neither do we.' _ George W. Bush, Washington, D.C., August, 2004. "The war on terror involves Saddam Hussein because of the nature of Saddam Hussein, the history of Saddam Hussein, and his willingness to terrorize himself." 'George W. Bush, Grand Rapids, Mich., Jan. 29, 2003. Most of Bush's misspoken sentences can be deciphered by ordinary folks. They can understand this plain spoken Texan. Occasionally, it takes a few minutes to break the sentence down to get the gist of what he is trying to say. However, there is one quote this reader cannot fathom despite many attempts. The jury is still out as to what Bush was trying to convey when he said, "I want to remind you all that in order to fight and win the war, it requires an expenditure of money that is commiserate with keeping a promise to our troops to make sure that they're well-paid, well-trained, well-equipped", in Washington D.C. on December 15, 2003.